In summer, we offer hiking and backpacking tours assisted by husky pack dogs as well as guided canoe trips on the Yukon River. You may also choose a trip that combines both, such as our 7-day Hiking with Huskies Combination Week, our 11-day "By Pack, Paddle, and Paw" Trip, or our 4-day Canoeing, Huskies, and History Trip. Our guided adventures include camping trips into remote Yukon wilderness as well as stays at our wilderness cabins and sled dog kennel at Lake Laberge, where you may enjoy guided activities during the days and return to the home cabins for overnight. Guests should be in good health, but don't need to be "super athletes." It is our goal to adjust our trips to individual abilities and comfort levels. For the health of our guests and our family, our trips are non-smoking. On our backpacking trips, our sled dogs join us for summer fun, helping out as pack dogs by carrying the food and tents, so you only need to carry your personal gear. It is a good way for dog lovers to enjoy a sled dog experience in summer and see the Yukon wilderness. For backpacking, you need to be able to carry your pack of personal gear over uneven terrain, including hills, for an average of four hours a day. If you think this might be a little "rougher" than you would like, you might consider basing your trip out of the home camp, exploring the spectacular Lake Laberge area during the day and returning to the home camp for overnights. Our canoe trips follow the historic Yukon River - the route taken by most of the gold-seekers in the Klondike Gold Rush. There are numerous places of historical interest along the way, which we stop to explore. Our wilderness cabins and sled dog kennel are located along the Yukon River system at Lake Laberge, so guests may choose to start or end their trip there. 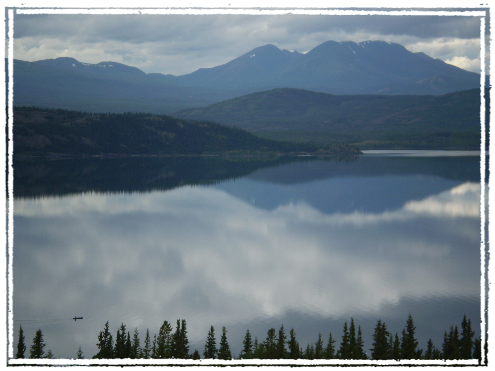 On trips based from our cabins, we explore the spectacular Lake Laberge area by foot, canoe, or boat on guided day trips. The dogs join us on our hikes for companionship and exercise as well as carrying the lunch. You may also wish to try a summer dog team ride on wheels (if it is not too hot) and see how the sled dogs are trained in summer.